How Hard is C25K? Ariane Takes Us On Her First 5k Run. Ariane is a Withings employee based in Munich, Germany, whose ultimate goal is to run a 10-kilometer race this September. Follow her first step in this journey as she tackles the halfway point: running 5km. I had a membership at a local gym for nearly two years, but I went maybe ten times during that period. The reason? Well, maybe you can relate to the drive that compels you to completely change your life at the beginning of every year. But a few weeks ago, it clicked with me that I actually needed to get moving. Why now? I had been working from home for about a year and a half, which had a noticeable effect on my well-being, especially after a very long winter. I felt weak and had permanent back pain. After visiting the orthopedist, I was in for a shock: I had a slipped disc in my cervical vertebrae. I know that herniated discs occur more frequently with advanced age, but I really am not that old yet. Physiotherapy and a lot of patience alleviated the pain at one stage. My body was telling me very clearly that I had to take better care of it. My decision was made: I would start jogging. If I couldn’t achieve my step goal by going to work every day, I could do it with this. I then got the okay from the doctor for my venture. I had the willpower! I still had trainers in my wardrobe from my gym days. The only thing that was missing was my (running) plan. I’ve heard a lot of good things about C25K. C25K stands for “Couch to 5k,” as in, it takes you from vegging out on the sofa to running a 5k. The running program the app uses was created in 1996 by American Josh Clark. That was when the entrepreneur discovered his love for jogging. Clark made it his goal to get more people to run. You can learn more about Josh Clark in our interview. What’s the idea behind C25K? It’s simply to close the gap between walking and running step by step and to be able to jog continuously at some point. So C25K is supposed to get you to run five kilometers continuously after an eight-week training session. 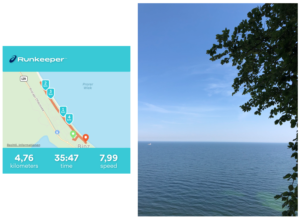 To track both my runs and successes, I also created a training plan in Runkeeper (iOS and Android). The great thing: I wear a Steel HR hybrid smartwatch, and I can easily connect Runkeeper to my Health Mate app (iOS and Android). Each workout includes a five-minute walk to warm up and cool down at the beginning and end of the session. You can have a look at the plan in its entirety here. To be honest, week 1 was hard going. I knew I wasn’t fit, but I would never have thought that jogging for 60 seconds followed by walking for 90 seconds would be so exhausting. And if I’m being really honest, every week and every change to the training plan was just as hard. The calf ache was painful, but I managed to get a good grip on it by stretching. I also worked out tricks to reduce stitches. The biggest challenges for me were the workouts where I had to run longer distances continuously for the first time. But I powered through. 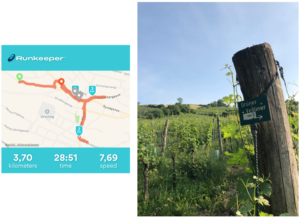 Even when I was on holiday, I “tortured” myself through 3.2k in hilly Vienna. But on the upside, I discovered the idyllic district of Grinzing and its countless vineyards. That was definitely worth the effort! The 4km stage happened on my Baltic Sea vacation. As hard as the workout was, I cherish the memory of the deserted beach promenade at 7:30 am—and the view of the endless sea. Spoiler alert: it definitely is possible! What did I learn after eight weeks? I learned that running pants should be of a certain length so that your thighs do not rub against each other while you run. Trust me, it’s painful. I also learned that I prefer jogging in the morning rather than in the evening. The feeling of having successfully completed a workout is terrific. I am extremely proud of myself for having made it this far. If I have one message, it’s this: if I can manage to do 5 kilometers, so can you. Just check with your doctor before you start and take advantage of all the free app help you can find out there. In the next article, I’ll report about the next stage of training. I’m signed up for the Erfurt Zoopark run, a 10k, and it’s coming up soon. I’ve got my fingers crossed—and my sneakers laced.